Join James on his mission to stop the evil plans of Dr. Derange, Skullcap, Maximillian Cortex and their leader - S.C.U.M. Lord! Get equipped with new weapons and gadgets in each level of action! His buddy IQ will be sure to lend him an electronic hand with devices that are bound to stop S.C.U.M.. So get ready to make a new legend for the Bond name as you race across the globe in your never-ending battle against the forces of evil! With a name like Bond, you know that intense action and daring adventure are here! 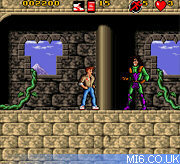 Join James Bond Jr. on several missions to root out and destroy the evil forces of S.C.U.M. Criss-cross the globe as you battle the evil Dr. Derange in Central America and the wicked Maximillan Cortez in the shadowy canals of venice! Above: Above: Front box art for the SNES version. All the while collect fabulous items that enhance your personal weapons into an unstoppable arsenal! Take on the scores of enemy jets, missile launchers and robot devices designed to tend your adventures - permanently. Do you have what it takes to fight you way the the deadly confrontation with the S.C.U.M. Lord? Use flying kicks and body rolls to keep their agents off guard! Your buddy IQ provides you with special items that'll blow S.C.U.M. away! Take a wild ride in a minicopter, a speedboat and jet - all customized with the latest in high-tech weaponry! Above: Super Nintendo (SNES) introduction screenshots. Three missions await James Bond Jr. - each one more perilous that the one before it... His first stop is the jungles of Central America. There he must find and defeat Dr. Derange before the evil genius discovers the treasure of the Temple of Gold. James must face S.C.U.M. agents on land and in the air (in his minicopter) to make it to his confrontation with the sinister doctor! Next, he'll dive into action in the canals of Venice, Italy. This is where the legendary DaVinci papers have led Maximillian Cortex on his quest for a secret invention. 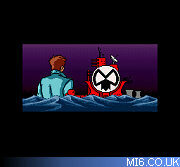 James has to pilot a specially armed speedboat through the deadly canals in search of the ancient item! In his final mission, James faces his ultimate enemy - S.C.U.M. Lord. And he can only be found on the coldest, most remote place on Earth. Remember the spy's motto - "Danger lurks within every shadow." 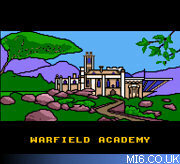 James Bond, Jr. was published by THQ - an American video game publisher and developer, located in Calabasas Hills, California. It produces games for video game consoles and Windows-based PCs. The name "THQ" formerly stood for "Toy Headquarters", dating from when the company was also a toy manufacturer. However, THQ has produced only video games since 1994. James Bond, Jr. was an animated spinoff, from the famous franchise, that centred around 007's nephew. When the series was created in 1991, the James Bond franchise was in its infamous limbo period following the release of "Licence to Kill" in 1989 and preceding the release of "Goldeneye" in 1995. Above: Super Nintendo (SNES) screenshots. 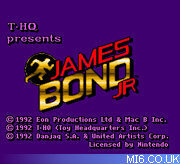 Following a long run of videogames by Domark, the licence to thrill (or rather, licence to shill) was passed to THQ for a spin-off game from the spin-off creation James Bond Jr. As with the TV cartoon, the game is also a bit of an anomaly in the history of Bond games. This was the first and last "Bond" game published by THQ, and there are very good reasons why. 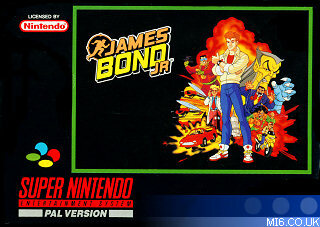 Unlike "James Bond: The Duel", released by Domark a year later, the 8-bit (NES) and 16-bit (SNES) versions of "James Bond Jr." differ wildly. The NES version is a platform and puzzle game, whereas the SNES version incorporates vehicle shoot-em-up levels and drops the puzzle elements completely - although both versions follow the same plot! 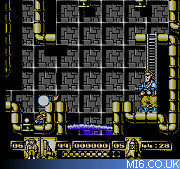 With the NES version, missions are passed after solving puzzles such as rearranging blocks to match the pattern on a computer console to disarm a missile, bouncing on a series of trampolines to reach a higher platform to retrieve an object from an enemy, and navigating a series of maze-like passages. 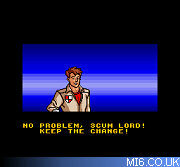 Bond tends to rely on brains as well as braun, but in the SNES version, success if mostly achieved using the fire buttons rapidly. 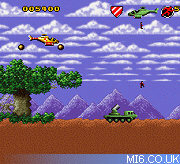 The introduction of vehicle missions (helicopter, speedboat, and jet) are simply disguised shoot-em-up mini-games that detract from Bond's image completely - even Bond Jnr. The removal of the puzzle elements cripple the game for players who prefer to think rather than bash controllers. 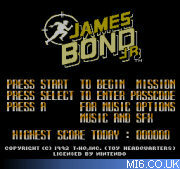 The common element between both versions are the platform based missions, which as with most Bond games, is a genre better developed and deployed in countless other titles. The gameplay is bog standard and enjoys no innovation over the common run-jump-duck-shoot action players have seen over and over before. Villains and allies form the children's TV cartoon series are utilised in the game, with accurate likenesses in the cut scenes and quite well delivered animation during gameplay. The SNES version makes the most of it's superior 16-bit hardware and delivers better graphics than the NES version, although neither is particularly special for it's platform. The music of the game, as with many Bond titles, is one of the highlights in an otherwise run of the mill outing. 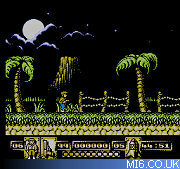 The James Bond Jnr theme makes the transition quite well, along with a couple of new compositions for background music. Compared to other "Bond" games, where this title shines is it's solid and polished delivery, despite the mediocre gameplay and lack of originality. Bugs are very few and far between, but that could be expected of a game engine that tries very little, and avoids anything difficult or innovative. On the whole, the SNES version works quite well as a kid's action game, with the NES version offering something different for those who look for more in a game than simple button bashing. 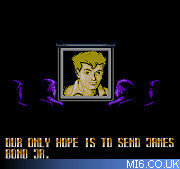 The game is delivered competently, but is lacking anything special - and this is why James Bond Jr fails. Lacklustre gameplay, average graphics and an uninspired plot leave this game totally forgettable. 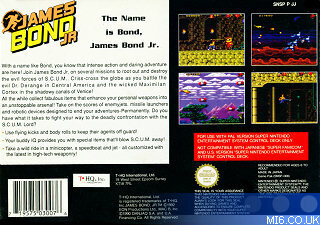 Viewed within the era that "James Bond Jr." was released, with the Bond films on hold until 1995, THQ produced a competent but dull outing with a spin-off licence that could have dared to do something new. Above: Nintendo Entertainment System (NES) introduction screenshots. What would a Bond saga be like without a bunch of really cool gadgets to make his life a little easier? 1-Up - Adds one life and increases health points to five! Each level has special items or weapons that might not be found in other levels. Super Jump Sneakers - Allows James to jump higher than usual. Laser Ring - Powerful weapon, especially when used against S.C.U.M. Above: Screenshots for the 8-bit NES version. Above: Super Nintendo (SNES) game climax screenshots. 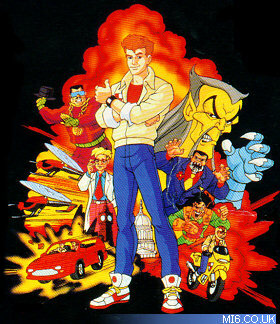 Levels 1, 3, 5 and 7 feature the James Bond Jr. character. Y Button - Use currently selected item. Note: While James has the Rocket Shoes, you must hold the Y Button continuously to make him fly. Levels 2, 4 and 6 each have a different vehicle for james to use. Jump onto the ledge to the right of you and get the tennis shoes hanging on the vine. Go to the right. Collect the things near the ceiling as you continue to the right and eventually you will emerge outside in a helicopter. Eventually, you will come to a cavern. After the cavern, you will emerge outside again and you will face a giant helicopter. Shoot the wall that the helicopter pad is on and it will damage the helicopter. Keep shooting it until the helicopter blows up and you will proceed to the next level. Head to the right until you get to the dark brown or black wall with the ladder. Head down the two ladders. To your right, you will see a hole with spikes at the bottom and a platform moving across. Cross the pit and take the path down. Eventually you will come to another brown ladder like you saw in the beginning of the level. Head down then head left. Head up the fourth ladder you see. Head left and you will come to another part of the temple. Head right and go up the second ladder you see. Continue to head to the right. You will come to some more ladders so head down them. When you come to another ladder, head down, and get the shoes near the snakes. Head to the left and you will come to another part of the temple that is red. When you get the 2nd ladder you see head down and jump across the pit of lava. When you get to the 3rd or 4th ladder you see head down. You'll know that as it's the right ladder if you are facing a dead end. Head down and go to the left to find a pit of lava. Jump from the moving platforms to get across and head up the ladder. Head left. Eventually you will come to a place where there are quite a few moving platforms. Head all the way down and to the right. Eventually, you will come to a single screen with a man dressed in green throwing...stuff at you. This level is fairly simple and is similar to the first section of Mission I. Simply drive along peacefully in your boat enjoying the view while destroying the enemies and getting the upgrades. Go up the ramps when you get the chance as they sometimes pass over land. Get the upgrades as well as they will get you over the land jumps in this mission. It is recommend that you do not blow up the civilian boats as they usually just jump on top of yours and you lose a life. Go to the right and you will come to a barrier. Use a grenade to destroy it. Keep heading right and keep using grenades to destroy the barriers and you will come to another part of the level. You can use your grenades to destroy the eels. When you get to the pit where you do not see a platform to jump on switch to your weapon that looks like a snowflake and use it on the water. The water will freeze and create a temporary bridge for you to walk across. Walk across the bridge, go up the ladder, and continue to the right. Do this for the next pit you come across and jump onto the metal platform and continue to the right. After a few seconds, you will come to another part of the level. Be careful in this section of the level as there are some spears that can pop out of the platforms you jump on, and in one section of water, they pop out in the water. After passing over the radioactive water, you will come to a dead end with a steel platform above. Jump around a bit and you will discover a secret springy thing that can send you up into the air that allows you to access the above platform. Continue to the right, destroy the steel pillars with your grenades, and you will be faced with a level boss. From a position, throw grenades at the bow or stern of the submarine and it will eventually blow up. This mission is a bit difficult at first. Use your cannon to destroy the little blue ships and for the large yellow ships, approach right in front of them, and fire as fast as you can. As their cannons only fire up and down at certain angles, you'll be safe in the middle. After destroying about three or four large yellow ships and destroying numerous small ships, you will come to a gigantic blue ship. Using your cannon, destroy the turret, and then using your bombs, destroy the red spot to proceed. You need to do this about three or four times and you will come to a thing that fires red balls. Just bomb the red spot and you will start on the second part of the level. Here, be careful how you jump as you can sometimes slide and end up in a pit. Be careful where you step as well as there are icicles that will drop from the ceiling. When you get to the cube in the middle of the hole, push it by running into it and use it to get up to the ledge. When you get to what seems like a dead end with a ledge above you, switch to your rocket shoes the way you switch weapons and press the fire button to get up. When you get to the ice barriers, use your grenades on them like you did with the steel barriers in the previous level. When you head down the first ladder that goes down, head to the right and destroy the ice barrier to get the laser ring. When you get to the boss fight, destroy the round ball with your laser ring and a few grenades and then kill the guard with a few kicks and explosives. Now, you will have beaten the game! Congratulations!